You’re looking for an easy, cheap Facebook ad that’s crazy effective, right? (I hear that request so often in the online space!) Well, here it is. 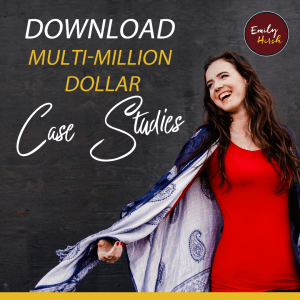 In this episode, I’m sharing the secrets behind one of our client ads that made $1 million from $1,100 ad spend! (Yup, you read that right.) This is our highest ROI to date, and it comes from… wait for it… Abandoned Cart Ads. Are you using those already? Are you using them effectively? Take 10 minutes to listen to this episode and learn why THIS particular ad resulted in 10,000% ROI for one of our clients, plus the 2 mistakes you need to AVOID to make these ads work for you. [1:22] Spend $1K make $1 million? Yes please. [5:35] Will this work for you, too? [In] today’s episode, I’m going to share with you guys an ad that produced 10,000 (yes, you heard that right!) ROI in one of our client launches recently. And this is such an easy ad to implement, such a cheap ad to run, and such an effective ad to have running in your funnel. So, it’s a very small audience. And I will share with you the ad in a minute. But, it was $1,100 ad spend to run this ad during the course of this live launch. It was a video, and it was going straight to a sales page, to then buy. And out of that ad, we had 612 purchases at a $2,000 cost product – so over $1 million made off of $1,100 ad spend. Like, literally jaw dropping, amazing, amazing results. Now. Here is what this ad is. 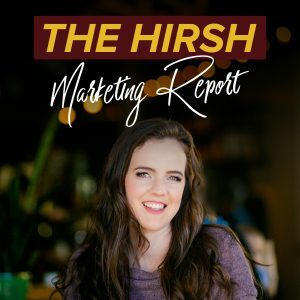 (And I’ve talked about it when I went through The Hirsh Process before, because it’s in Step 4 of The Hirsh Process, which is your sales ads.) … And that is an abandoned cart ad. That means an ad that you are directly targeting to somebody who has landed on your Order Form Page of whatever you’re offering, but has not landed on the Thank You/Confirmation Page after buying. So they have not bought essentially. And the reason we set it up that way versus like, an email list is you’d have to constantly update an email … Well, you can’t even do an email list of people, unless they’ve come in from your webinar or something. But this way, if you set it up on the Pixel … I guess you could do an email list of purchasers … But the easiest way to set it up is [there’s] an audience in Facebook of people who have landed on the cart, but not landed on the Purchase Confirmation Page. And that way you can either ongoing run this, if your product is always available, or have this ad running during your launch. Now here’s the keys with this ad. So, the mistake people make is they just put up an ad… First of all, the mistake people make is they don’t do this. They don’t run this ad. The second mistake people make is they will have a very generic ad ran to these people. But the key here, and why this ad did so well, was it was a video ad. It was shot straight with an iPhone camera, very organic, connecting-looking, not like this overly-produced ad that doesn’t make somebody want to say, “Hey, I love her. I want to be her friend.” And it was directly talking to this person. So we know, because this audience that we’re targeting, we know that they were so close, on the fence of buying our product that they made it to the Order Form. They’re very close, right? They’re about to pull the trigger, so what we want to do is speak to that in the actual ad – and ideally with a video. So the actual ad copy we had was super basic, maybe two lines. And then the actual video was also super basic, but it spoke to exact paypoints of … Like for example, this was a course, so: “Hey, I know you’re right on the edge! You want to join [such-and-such] course, but you haven’t pulled the trigger yet. Trust me, I’ve been there.” Maybe small, short story about how you were there or how a client of yours was there before, and wanted to pull the plug and didn’t. And then, “BUT if you take this chance,” we have either a guarantee or whatever the guarantees are, “But if you take this chance, you’ll be able to change your life around, grow your business,” whatever your promise is. Also, then remind people, “And don’t forget,” and then whatever the urgency is: doors close on this date, or doors close in a few days, or registration’s closing, or the product’s going to sell out, whatever it is, so they take action. Because the goal with this ad is to connect with them, to build the final step of trust that you might want to build with them, because they are on the fence. They’re almost a sale. And then, to show them urgency so that they pull the trigger and essentially buy. And then we had a little clip of that student, “Maybe you’re like Jesse” … I’m making up names, because I don’t want to say any names … “who,” this is the story, and then we showed that video, because it could be exactly what that person is experienc[ing]. So first of all, regardless of like, if you have a product, service… This can apply to so many things. Like for this, we do abandoned cart ads; but let’s say your goal is for somebody to go and fill out an application, because you do high ticket sales – do abandon the application ads. Wherever someone steps in your funnel, tie an ad to it. And it’s so cheap to run this, because you’ve already paid to get the person that far, right? Like … maybe not even paid, but you’ve already gotten the person that far, so the audience is super small. You don’t have this crazy big audience who you need to target. And that’s why we were able to spend $1,100 to make $1 million off of that ad. Now obviously like, they may have come in from other places to ultimately end up on the cart page, so you have to take that into consideration, but that could have been 612 sales that we wouldn’t have had if we weren’t running that ad to stay top of mind. The other thing is, it was a live launch, so no matter where they were in the process of the launch, like… if they had watched the webinar or not, or if they had been to the sales page or not, or the order form page or not … they were seeing ads that were tailored to them. That literally gives me goosebumps, because it’s so powerful! Like if you really think about that …. Based on actions people are taking, we showed them ads that [were] tailored exactly to what they needed to hear to take the next step. Like, how freaking powerful that is… And the huge thing is, here it’s like, you don’t have to spend a lot of money for these things to be successful, because the audience is so small that you could reach them with a small, small budget. And if you do it right and your messaging is right, you can really, really nail this and make a lot of money. So the key is, one, having this set-up, whether it’s a product, a service, or whatever it is … I mean, you’ll see Amazon do this all day long … Have it set up, but then for a lot of people, where there’s emotion involved, make it very intentional with what you do – whether you use a testimonial, whether you film a very connective video, you want to knock down any objections that the person is having to buying. And then put in your promise – remind them of your promise, and then the urgency. Those are the key things, and if you can do … Don’t overproduce a video. Video is the best way to do this, and I like it just straight on the phone, because you don’t want it to be overproduced, because then they feel like, “Oh, this is an ad.” They won’t feel like it’s an ad if it’s a video from on the phone. That is our highest ROI ad we have ever had, that we ran to date in the agency. 10,000 percent ROI is insane, $1 million made off of this one ad with $1,100 ad spend. So if you’re not going to run over and create those abandoned cart and abandoned sales page ads right now, I don’t know what else you would be doing! And if you guys want strategy like this, analyzed on your funnel, and ads created for your funnel that [are] very intentional, with our strategies of how we do retargeting and how we specifically tailor the messaging in our retargeting ads to be insanely successful, go to HelpMyStrategy.com and book in a call with the Hirsh Team.